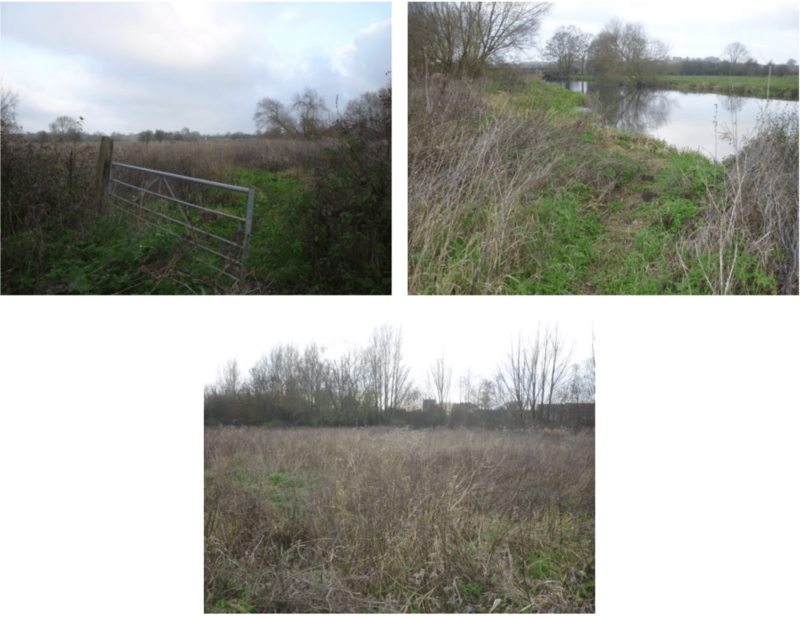 Current Properties - GARETH HOLLAND & CO. LTD.
A parcel of land some 1.73 hectares (4.29 acres) or thereabouts with frontage to the River Trent and Mill Stream. To download a PDF of the particulars, click here. 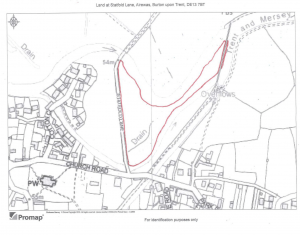 The land is located to the north of the village of Alrewas, off Church Road, Alrewas with access being via Statfold Lane which leads north from Church Road over a Bailey Bridge across the Mill Stream. The land extends to some 1.73 hectares (4.29 acres) or thereabouts with the ownership understood to extend to half the width of the River Trent and Mill Stream where the land abuts these water courses, with the Trent & Mersey Canal abutting the land on the eastern boundary. The land has been used for grazing purposes in the past, with part now being a naturally regenerated woodland area. The land does fall within the boundary of the National Forest and Grant Aid for tree planting may be available from the National Forest Company, subject to meeting appropriate conditions. The access via Statfold Lane is subject to a maintenance liability. Services – There are no services known to be connected to the land. Tenure – The property is freehold, with vacant possession upon completion. Basic Payment Scheme – The land is understood to not be registered with the Rural Payment Agency. Easements, Restrictions and Outgoings – The land is sold subject to any that may exist, whether specified in these particulars or not. Timber, Sporting and Mineral Rights – As far as we are aware, all timber, sporting and mineral rights are believed to be in hand. Name and address of Solicitor. All measurements, distances and areas referred to are approximate and based on information available at the time of printing. Fixtures, fittings and any appliances referred to in these details have not been tested or checked and any reference to rights of way, easements, wayleave, tenure or any other covenants/conditions should be verified by the buyer’s legal representative prior to exchange of Contracts. Photographs, plans and maps are indicative only and it should not be assumed that anything shown in these is included in the sale. These details are for guidance only and do not constitute part of the contract of sale. Gareth Holland & Co Ltd are not authorised to give any warranties or representatives (written or oral) in relation to the sale. Buyers are advised to seek clarification on any points of particular interest, prior to pursuing their interest in this property. Alterations to the details may be necessary during the marketing. Due to a change in legislation from 1st March 2004 we are required to check the identification of vendors before proceeding to market any property, and purchasers on acceptance of an offer and before we can instruct solicitors to proceed. This is a legal requirement and applies to all Estate Agents. Suitable identification should include either a current passport or new style driving licence with photo together with a utility bill for proof of address. These particulars, whilst believed to be accurate, are set out as a general outline only for guidance and do not constitute any part of an offer or contract. Any intending purchaser should not rely on them as statements or representations of fact and should satisfy themselves by inspection or otherwise as to their accuracy. No person in the employment of Gareth Holland & Co. Ltd. has any authority to make or give any representation or warranty in relation to this property. The Agent has not tested any of the services or installations to the property and so cannot verify that they are in working order. A buyer is advised to obtain verification from their Solicitor or Conveyancer. References to the Tenure of the property are based on information supplied by the Vendor. Prospective purchasers should consult their own Solicitor for verification. Plans and Maps: Plans and maps attached to these particulars are for identification purposes only. Prospective purchasers should check the Contract Plan for verification. 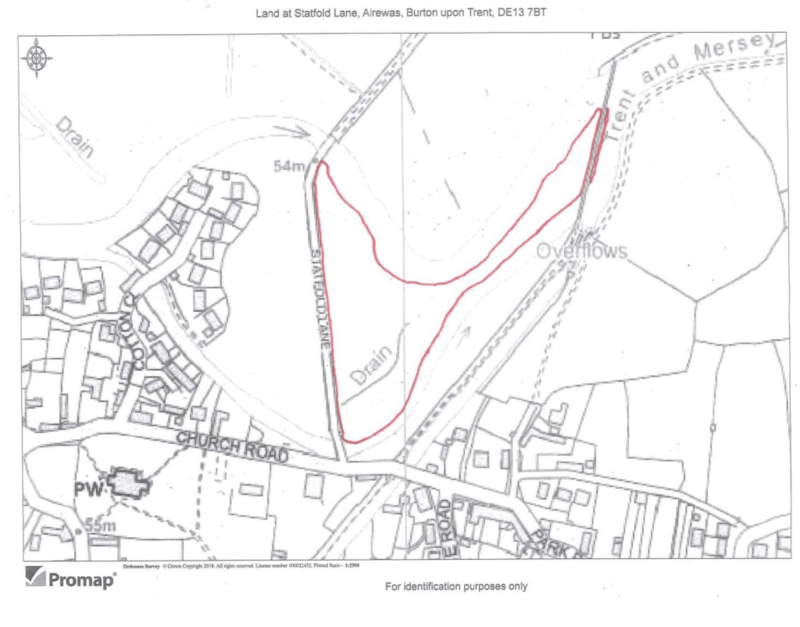 0.75 Acres with planning consent for the construction of two detached dwellings. 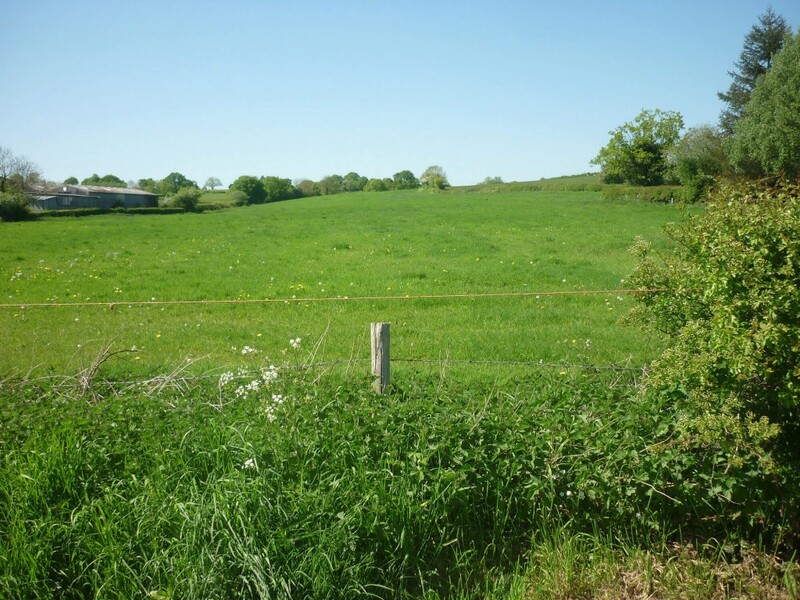 A parcel of land extending to some 0.3053 hectares (0.75 acres) or thereabouts with planning consent for the construction of two detached dwellings, to be sold as one or two lots. A development opportunity at Yoxall Road, Newborough for the construction of two dwellings. 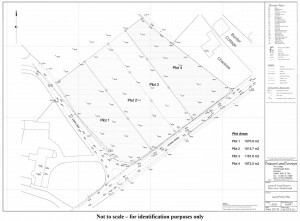 The site consists of part of the area for which planning consent was granted for the construction of four dwellings under the planning consent of 31st January 2018 (ref: P/2017/00612) granted by East Staffordshire Borough Council. Conditions 4 and 7 of the planning consent have subsequently been discharged under application P/2018/00734 dated 14th August 2018. 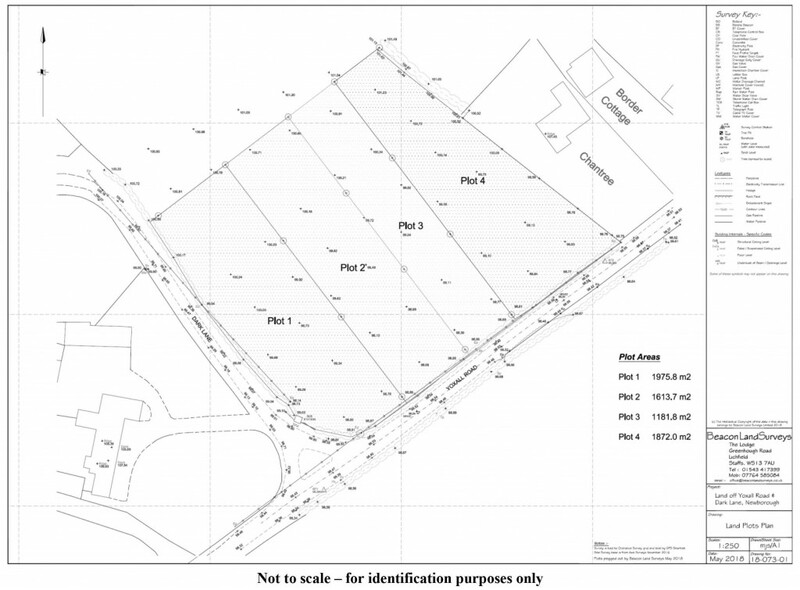 The plots on offer are plots 3 and 4 as shown on the attached plan, with plots 1 and 2 being retained by the vendors. Plot 3 extends to some 1,181.8m² or thereabouts, with plot 4 being some 1,872m² or thereabouts. The plots have been pegged out on site. Note: the dwelling on plot 3 is to be an “Affordable Starter Home” under the terms of the S.106 Agreement forming part of the planning approval. The purchaser will be required to meet all obligations under the S.106 Agreement. Services – Interested parties are recommended to make their own enquiries of utility companies to identify the services available and their suitability. Fencing – The vendor will erect a post and rail fence to the northern boundary of the land, with the purchaser(s) to be responsible for future maintenance and any additional requirements for their own purposes. The fencing between plots 3 and 4 is to be the responsibility of the purchaser of plot 4, with the fence between plots 2 and 3 to be the responsibility of the purchaser of plot 3. Name and address of Solicitor. It is proposed that contracts be exchanged within 14 working days of receipt of Contract documentation from the vendors solicitors with completion to be within twenty eight days of exchange of Contracts. The vendors do not undertake to accept the highest or any offer.